We're inching ever closer to Splinter Cell Conviction's April 13th release date. 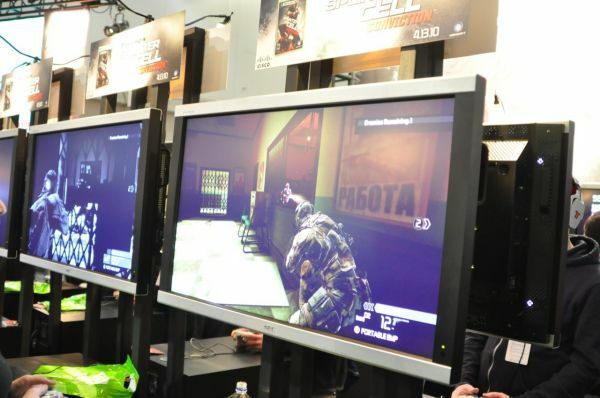 And while Gamestop may claim you'll be the first to play the game's co-op mode, we actually got our hands on it this weekend at PAX East...along with 50,000 other gamers. It's not the ideal environment playing a co-op stealth game in a noisy convention center, but my co-op partner and I donned some headsets as the game briefed us on some back story eager to dig in. This is where we hit our first annoyance - unskippable cutscenes. Soon it was onto the game, dropping our pair of operatives in a dark alley tasked with infiltrating a building and disabling the security system. If you've played the single player demo you're probably familiar with the lack of UI, replaced by mission objectives projected on in game walls. This holds true for the game's co-op mode as well. Our first task involved taking down a guard as he entered a locked gate, which was our perceived way in. My partner quickly dispatched him earning us our first marked take down thanks to a quiet melee kill. Marked take downs allow you to mark and execute enemies in rapid succession. We split up as we entered the court yard, and while visibility was tight, using our in game gadgets revealed the locations of all enemies either myself, or my partner could see. Once we snuck inside, both my partner and I had to work together to trigger an EMP device in the security room. Room by room we slowly worked our way towards our goal, trying to silently take out guards. Sadly, we failed a few times, as we found ourselves playing the game more run and gun then stealth and shadows. Once the EMP was detonated, we were assaulted from all sides by the enemy. But with the lights and cameras out we had the advantage, and the little ghost outline of your guy on display where the enemies think you are, it became incredibly easy to plan flanking maneuvers as if there were four of us playing co-op instead of two. While my partner exchanged volleys of fire with the enemy, attracting them towards him, I managed to leap over a balcony, and shimmy my way behind - dropping down for quick silent kills from behind. This meant more marked takedowns available for us. The game lets you know when you are hidden from enemies by turning the screen black and white, and as you become unveiled the colors and contrast increase. It's a nice subtle effect that almost feels natural. Sadly, as good as this plan seemed, it also split us up, and when my partner went down above I was unable to get to him quickly to revive. With him gone for a distraction the enemies quickly turned on me and it was a final mission over for our demo. Overall controls were tight, graphics were crisp and co-op gameplay was fun. 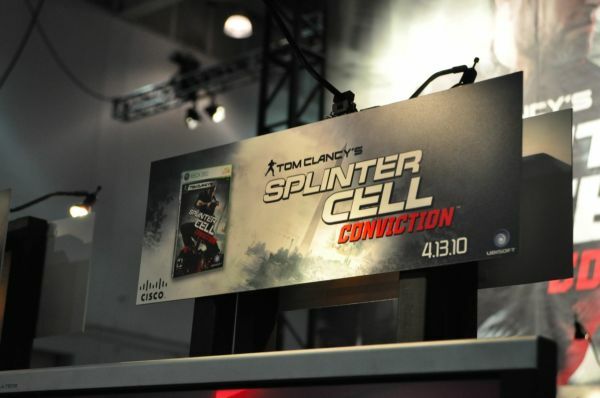 I can already tell with just the small bit I played, and from watching the reactions of the PAX East attendees that Splinter Cell Conviction will be a huge co-op title when it launches a few weeks from now.